This super soft fleece blanket makes the perfect gift for a new baby or a child. 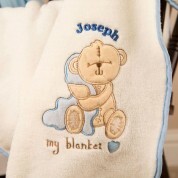 We embroider any recipients first name on top of the teddy bears head. It makes the perfect new born, birthday or Christmas gift and is ideal for putting in the pram or in their cot to keep them warm. When it is not in use it can be stored away in its box. Dimensions: approx 70cm x 70cm.